Like discovering a neighborhood house assumed to be vacant is actually inhabited, over the past decade researchers realized that most galaxies have at least one black hole in residence in their central regions. But these black holes aren't the stellar variety with three to ten times the mass of our Sun. Their size swamps the imagination- they have millions, sometimes billions, of solar masses. Even our home galaxy, the Milky Way, has a four million solar mass black hole located at its center, about 27,000 light years from Earth. Galactically speaking, that places it in our own backyard! Well, there goes the neighborhood! At the heart of virtually every large galaxy lurks a supermassive black hole with a mass of a million to more than a billion times our Sun. Most of these black holes are dormant, but a few per cent are 'active' meaning that they are drawing material from their host galaxy inwards, This forms an accretion disc that feeds the black hole. As the material spirals through the disc toward the event horizon, it gains fantastic speed and releases vast amounts of energy. As a result, some of the disk material does not fall in because its speed achieves escape velocity. This material is slung around to one of the poles and expelled as a powerful jet traveling near the speed of light. We also now know that supermassive black holes are inexorably linked to the galaxies that encircle them. For example, the size of a supermassive black hole appears to have a direct correlation to the galaxy where it exists. Almost a decade ago, researchers calculated that the mass of a supermassive black hole appeared to have a constant relation to the mass of the central part of its galaxy, known as its bulge (think of the yolk in a fried egg). This 1 to 700 relationship supports the notion that the evolution and structure of a galaxy is closely tied to the scale of its black hole. Other studies found another strong correlation. This one was between the mass of a supermassive black hole and the orbital speed of stars in the outer regions of their galaxy where the direct gravitational influence of the supermassive black hole should be weak: the larger the black hole, the faster the outer stars travel. Thus it's now believed that black holes are not only common throughout the Cosmos but they play a fundamental role in the formation and evolution of the Universe we inhabit today. In fact, we would not be here without them. Most astronomers believe that the Universe began about 15 billion years ago with an explosion known as the Big Bang. All the matter in the Universe, all the space and even time, itself, was released during this event. Hundreds of millions of years followed before matter started to collect into vast clouds then coalesce and collapse, under its own weight, into the first stars. The first stars were huge, hot and powerful. They consumed vast amounts of material and therefore only shined for a few hundred million years. For comparison, our Sun has been shining for over four and a half billion years. When the nuclear fuel powering the first stars became exhausted, the explosion that followed threw off material that became incorporated into the next generation of suns. But, due to their prodigious mass, their cores continued to shrink until they became gigantic black holes, millions to billions of times more massive than our Sun. Stars are created when vast clouds of hydrogen gas and other material fall in upon themselves due to their own weight. This can be provoked by the gravity of a passing star or the arrival of pressure waves from a supernova explosion that introduces instability by nudging one side of the cloud. As it collapses, the cloud breaks into smaller and smaller pieces. In each of these fragments, gravity begins to release heat energy and the fragment condenses into a rotating sphere of super hot gas known as a protostar. Over time, the pressure and temperature within the protostar becomes so intense that a continuous thurmo- nuclear explosion is triggered. With the onset of this chain reaction, hydrogen begins to fuse into the next heavier element, helium. The force of this ongoing, relentless release of energy pushes outward until it reaches an equilibrium with gravity and, as a result, the cloud stops collapsing. Once the radiation from the internal explosion reaches the cloud's edge, it escapes into space as light and thus a star is born. When the non-stop internal nuclear explosion that powers a star has converted its hydrogen into helium, the star inflates and begins a new round of energy release by converting helium into carbon then carbon into oxygen followed by other elements up the periodic table. In essence, stars are factories that create the material comprising everything in our world- including ourselves. However, these new fuel sources are depleted at faster and faster rates until the star begins to produce iron at its core. Unfortunately, iron cannot be used as nuclear fuel, so the thermonuclear activity at the star's core begins to shut down. When the core stops releasing enough energy to prevent the constant crush of gravity from taking over and squeezing it inward, the star collapses in the wink of an eye. For example, if a star contains less that two or three times as much material as our Sun, then the force of the sudden inward rush will rip it apart in an titanic explosion called a supernova. The explosion exposes the star's core- a dense, city-sized ball of material made only of atomic neutrons- and it slowly begins to cool. However, if the star contains more than three times the mass of our Sun, then the star's core will continue to shrink until it becomes an infinitely small object with all the mass of its former self. Astronomers call this a black hole- the bottomless pit in the fabric of space-time that Schwarzschild discovered in Einstein's equations. 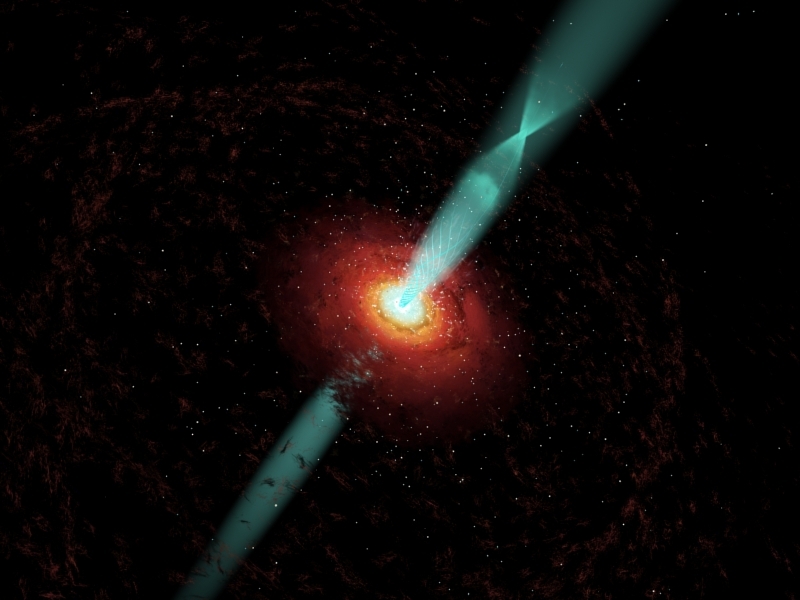 These first black holes were both destroyers and creators- swallowing material that came too close while throwing jets of high-energy particles and radiation generated by their violent feeding frenzy. The jets, which can be millions of light-years in length, are believed to have triggered the formation of successive stellar generations and thus seeded the first galaxies with starlight. Therefore, these original supermassive black holes most likely arose prior to and helped in the creation of the galaxies that continue to spin about them. They were essential to galactic evolution (they still are!) and, in the long run, to the creation of our Sun, our planet and our very existence. They are both the the universal omega and the cosmic alpha. This amazing animation models the 4 million solar mass supermassive black hole at the center of our Galaxy, the Milky Way. 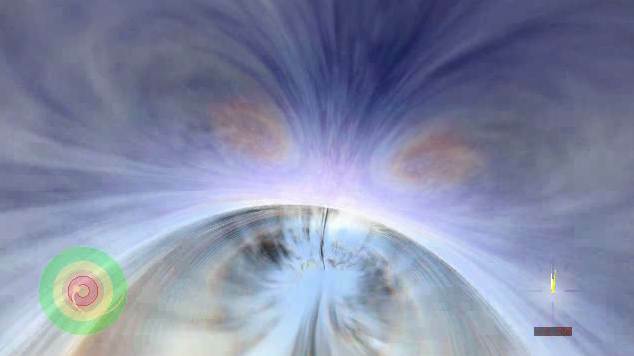 It places the viewer inside the accretion disk as they travel towards and through the event horizon. 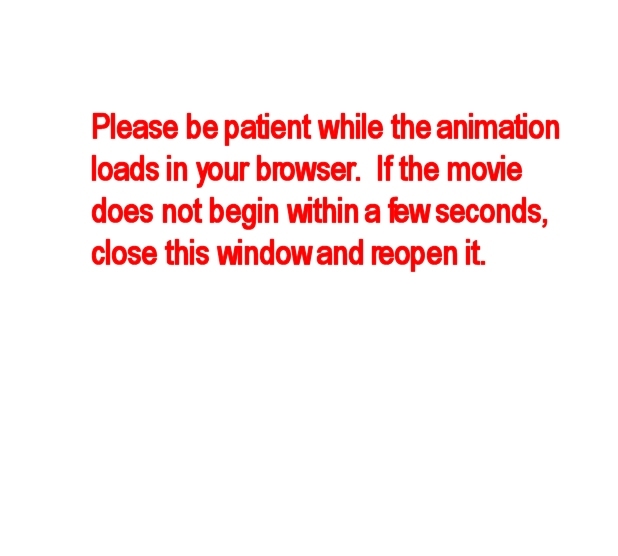 The graphic on the lower left shows the viewer's position. On the right, the clock shows the viewer's proper time, in seconds until vaporization by the inflationary instability at the inner horizon. Galaxies can be divided into two distinct categories based on the feeding status of their supermassive central resident. Inactive galaxies, for example, have supermassive black holes in quiescence- like a satiated cosmic beast, they sleep in between meals. 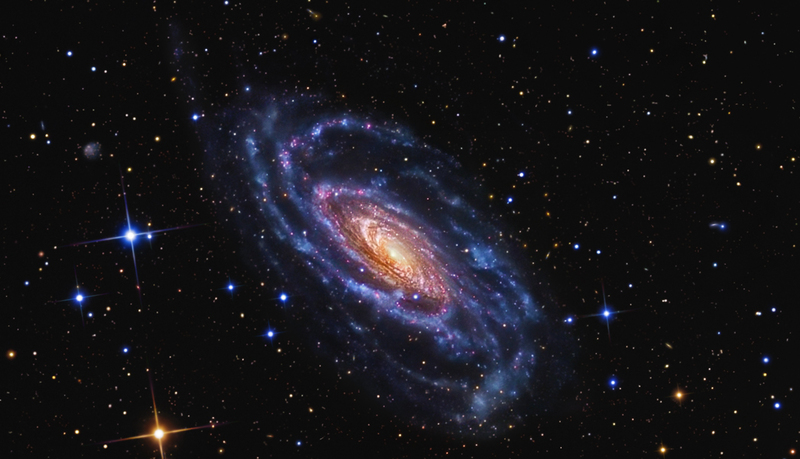 Examples include our Milky Way galaxy, NGC 3031 (M81), NGC 5457 (M101) and NGC 891. But dormancy can be temporary. If a star strays too close or a cloud of gas and dust ventures into the black hole's accretion disc, the black hole will awaken, become active and release vast amounts of energy and potentially lethal radiation that reverberates throughout its galaxy. An active galaxy is no place to be or venture near. Examples include NGC 1275 (pictured at the top of the previous page), NGC 1097, NGC 4258, and NGC 5033. 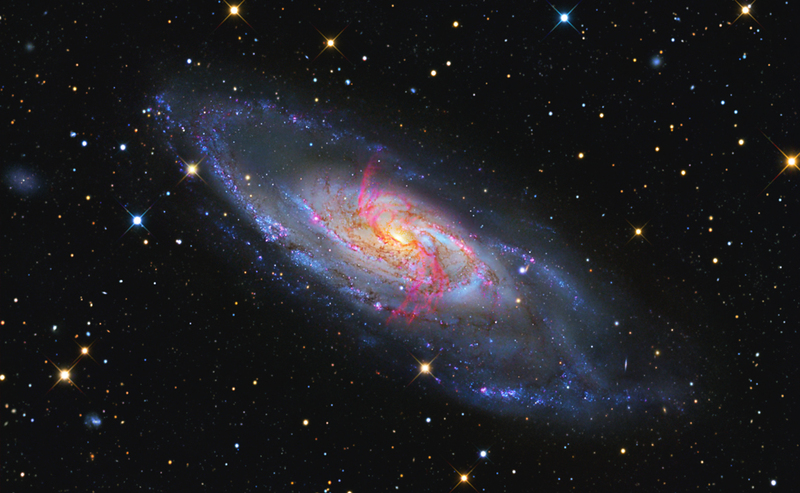 Located in the northern constellation of Canes Venatici, NGC 4258 (M106) has been know to have a mysterious extra set of arms for many decades. Shown here in vivid red, the extra appendages are now known to be caused by a high energy jet emanating from the supermassive black hole in the galaxy's center. The jet creates a shock wave that excites material in the galaxy's halo, seen here in the ionized light emitted by hydrogen atoms. Seen in the light emitted by hydrogen molecules when they become ionized, these arms display an artificial red hue to make them visible in the image that accompanies this article. The extra arms are now believed to be caused by high energy jets emanating from the galaxy's active 40 million solar mass central supermassive black hole. Because the jets are tilted at a low inclination they pierce the disk and surrounding halo of this galaxy. So, as the jets pass through regions of gas, they create an expanding cocoon of shock waves that heats the surrounding material causing it to release radiation in optical wavelengths. The curvature and fraying seen at their extremities represents previous trajectories of the jet due to past precession. Precession is a change in the orientation of the rotation axis of a spinning object. For example, the wobble of a spinning top. Interestingly, water molecules in the accretion disk surrounding the supermassive black hole at the center of NGC 4258 have become so excited that they amplify microwave radio emissions in a manner similar to the way in which a laser amplifies light. These powerful naturally-occurring microwave amplifiers are called masers. The discovery and measurement of the masers in this galaxy have made distance estimates between Earth and other galaxies more precise. Most galaxies are located in a group with other galaxies and even these are organized into larger associations called super clusters. They are formed at the junction of large gravitational bubbles that seem to fill the Universe. Galaxies are in constant motion within their cluster and, over time, they may approach, collide and combine. This is the way galaxies grow and evolve- most galaxies have interacted with others at one time or another since they were formed. Mergers are thought to have contributed significantly to the growth of galaxies- the early universe was much smaller and incredibly crowded therefore galaxies were more likely to collide. The sprial galaxy NGC 5033, located near the northern Big Dipper in the constellation of Canes Venatici, has two supermassive black holes which indicate that the star system survived a merger with another galaxy sometime in the past. Eventually, the black holes will collide releasing titanic amounts of energy causing the galaxy to become even more disturbed than seen in this recent view. If two galaxies merge, so should their central black holes. Recent computer modeling speculates the event would be violent, unleashing tremendous energy as trapped gas rushes between the two black holes. Galactic mergers take millions of years to complete but there are plenty of examples for astronomers to study. For instance, located about 37 million light years from Earth in the constellation of Canes Venatici NGC 5033 displays evidence of major activity driven, in part, by two supermassive black holes located in its central region. It's suspected that the second black hole was acquired sometime in the past when NGC 5033 survived a merger with another galaxy. This merger resulted in much of the turbulence and apparent chaos taking place inside this star system. New stars are being born at a furious rate. Over time, the pair of supermassive black holes will gradually get closer and eventually crash into one another. The dramatic collision will unleash intense radiation, gravitational waves and ripples in the fabric of space-time as predicted by Einstein.